A pimple inside your nose can look like a painful bump and it can cause you a lot of discomfort. Pimples form when hair follicles get plugged with excess oil and dead skin cells. If bacteria get into the blocked follicle in your nose, this can cause the pore to become inflamed and itchy, resulting in pus-filled pimple. Sometimes, the nasal pimple or pustule can become tender and very painful to touch. Because of where they are found, pimples inside your nose can be challenging to treat. The tissue in your nasal passage is more sensitive than your skin and there is more chance of bacteria lingering in your nose. However, you can successfully treat pimples in your nostrils with effective home remedies. It is important to treat pimples inside your nose properly. If the inflammation becomes worse or you try to pop the zit, this can cause the infection to spread and may result in a boil in your nose. The best types of natural home treatments for pimples in your nose use antibacterial and anti-inflammatory ingredients. Therefore, remedies that include tea tree oil, aloe vera, and apple cider vinegar are perfect for killing off nasal infections and reducing swelling in a painful nose bump. Most people assume that outbreaks of acne only affect their face, back (sometimes called bacne), and upper chest. Acne pimples can also appear in your nose if excess sebum (the oil the skin produces) blocks pores inside your nose. However, acne isn’t the only reason for pimples in your nose. A common reason for getting inflamed pimples at the opening of your nostrils or deeper inside your nasal passages is plucking hairs from your nose. When hair inside your nose is trimmed or plucked, this can cause bacteria to get into the open follicle causing inflamed nostril bump. Other reasons for having sore bumps inside your nose are nasal furuncles, small skin growths called polyps, hay fever, and stress. Apart from a red, swollen bump inside your nose, the zit in your nose may also cause other symptoms. Getting rid of a pimple inside your nose with natural home remedies is quite straightforward. In fact, you may already have at home all the necessary ingredients to make your own antibacterial nasal pimple treatment. Here are some of the best home remedies to get rid of infected bumps from inside your nose. Placing a warm compress on a large pus-filled pimple is one of the best ways to drain a pimple and make it heal quicker. If the pimple is near the nasal opening, you can place the compress on the bump. If the pimple is deeper in your nose, placing a warm cloth on the outside of the nose will be just as effective. Make a warm compress by dipping a washcloth in hot water. Make sure the washcloth isn’t too hot to burn your skin. Hold the compress on the outside of your nose (or inside if it’s not too swollen and painful). Hold it there for 10-15 minutes. Repeat 3-4 times a day to help bring the pimple to a head and drain the pus. Once the pimple drains, you can apply some of the home remedies for pimples from this article to help the wound heal quicker. Remember, you should avoid the temptation to pop a pimple (especially if it is a blind pimple) as this may cause the infection to spread deeper into your nose. If the boil or pimple hasn’t reduced in size within a few days of applying the compress, you should see a doctor for the bump in your nose. Rinsing the infected pimple with a simple salt water solution is a very cheap and effective way to get rid of a pimple inside your nose. The antibacterial properties of salt help to kill off any infection in skin tissue and help to reduce swelling, helping the white head in your nose heal faster. All you need to make this home remedy to get rid of a nasal pimple is some salt, warm water, and a cotton swab. Thoroughly mix 1/4 teaspoon salt in a cup of warm water. Soak the end of a cotton swab in the saline solution. Gently apply the salt solution to the pimple inside your nose and dry with a clean cotton bud. Use 2-3 times a day to help speed up the healing time of the inflamed nasal bump. Use the salt remedy daily until the swelling of the pimple has gone and you no longer have a sore pimple in your nose. There are many essential oils that can help to destroy pimple-causing bacteria and help pimples in nose heal quicker. Here are the best two essential oils you can use as a spot treatment in your nose. Unlike other essential oils, tea tree oil and lavender oil are gentle enough to be used on a small area of skin. You can put a drop or 2 of either of these two oils on the end of a cotton swab and gently apply to the zit inside nose. Use 2-3 times a day to kill off bacterial infections from your skin that cause pimples. Lavender oil and tea tree oil can also be used with carrier oils to make a soothing healing ointment for pimples. One of the best carrier oils to use is coconut oil. Applying a little virgin coconut oil to the inflamed pimple in your nasal passage can provide relief from itching and help the bump heal quicker. One of the benefits of coconut oil is that it is a natural source of lauric acid which has antibacterial properties. The fatty acids in coconut oil will also help to soothe pimple inflammation. Mix 2 drops of tea tree oil, one drop of lavender oil, and 1 tablespoon virgin coconut oil. 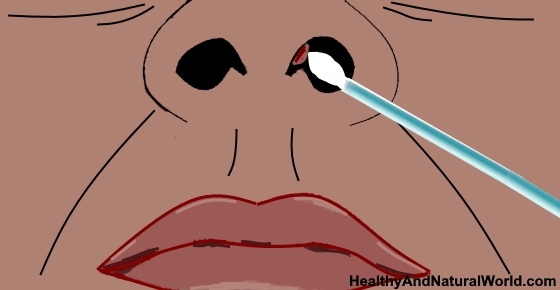 Using a cotton swab, apply the healing ointment to the inflamed pimple inside your nose. Apply 2-3 times a day to kill off infection-causing bacteria and get relief from the symptoms of pimples. Due to its astringent and antiseptic properties, witch hazel is a great natural remedy for treating pimples inside your nose. Witch hazel helps pimples dry out faster, thus promoting healing. Soak the tip of a cotton swab in pure witch hazel. Apply the witch hazel to the affected pimple inside your nose. Use the natural remedy 2-3 times a day to get relief from the inflammation, itchiness, and discomfort that the nasal pimple causes. You could also add a drop or 2 of tea tree oil or lavender oil to help make witch hazel an even more effective pimple treatment. Another excellent home remedy to address the problem of nose pimples is apple cider vinegar (ACV). Raw, organic apple cider vinegar contains acetic acid which can help to alleviate swelling, itchiness, and redness in a pimple. According to a research published in the journal PloS One, acetic acid destroys bacteria that is responsible for skin infections and inflammation. Because of its acidic nature, apple cider vinegar helps to stop itching and discomfort that you often feel with a pimple inside your nose. Dilute one part raw, unprocessed vinegar with 2 parts water. Apply to the pimple in your nasal passage using a cotton swab and allow to dry. Dab apple cider vinegar on the infected skin area 2-3 times a day to help the pimple inside your nose heal quickly. To soothe an itchy, swollen red pimple that is irritating the inside of your nose, apply some aloe vera gel. Aloe vera is a classic home remedy for any kind of skin inflammation and you can use it to take the redness out of a pimple. All you have to do to get rid of a pimple inside your nose it to regularly apply aloe vera gel. Do this 2 times a day and continue using the aloe vera remedy until the boil-like pimple in nose has completely gone. You can also add some witch hazel or a drop of tea tree oil to help improve the effectiveness of aloe vera as a spot treatment. One way to get rid of a pimple in one of your nostrils is to inhale steam that contains healing essential oils. Breathing in steam through your nose will help open up pores in your nose and the antibacterial effect of tea tree oil or lavender oil will help kill off bacteria. You could also use a few drops of eucalyptus essential oil in the steam inhalation if you also have blocked airways. In a large pot of boiling water, mix in 3 drops of tea tree oil and 3 drops of lavender oil. Put a towel over your head and deeply breathe through your nose to get rid of bacteria, oils, and dirt that is trapped in your nose. Keep doing this for 10 minutes to speed up the healing process of the pimple. Use 2 times a day to get relief from the pimple inside your nose. To dry out pus from an infected bump in your nose, you can apply a natural baking soda paste to the pimple. Baking soda has many uses in the home to remove and destroy bacteria. Baking soda has a lot of benefits for your skin, it is also anti-inflammatory in nature and is great for reducing inflammation in boils. Studies into the healing effect of baking soda have found that it has effective antibacterial activity. Applying baking soda promotes wound healing and helps prevent the spread of further infection. Mix some water with 1 tablespoon baking soda to form a paste. Add 1 or 2 drops of tea tree oil to boost the anti-pimple effect of the remedy. Use a cotton swab to apply the baking soda remedy to the pimple inside your nose. Allow the baking soda remedy to go to work for 10-15 minutes to help dry out the pimple. Rinse with warm water and apply some coconut oil to the inside of your nostrils to moisturize them. Don’t pick your nose to prevent damaging the lining in your nostrils. If you need to put your finger in your nose, wash your hands before doing so. Try to avoid blowing your nose too hard to prevent the spread of bacteria in your nose. Air helps pimples and boils in your nose to heal, so don’t plug your nostrils with tissues or cotton. Try to reduce stress naturally to prevent acne flare-ups. AAD. How to treat boils and styes. Br J Plast Surg. 2000 Jan;53(1):42-5. Med J Aust. 1990 Oct 15;153(8):455-8. J Dermatol Sci. 2014 Mar;73(3):232-40. Compend Contin Educ Dent Suppl. 1997;18(21):S17-21;quiz S46. WebMD. Before you pop a pimple.